Chia is a pearl of the south of Sardinia: the undisputed purity and transparency of its waters and lush vegetation make it one of the most appreciated areas. The Hotel Spazio Oasi, part of the elegant Chia Laguna, is located about 50 km from the chief town Cagliari and close to some of the most beautiful beaches of the southern coast as for example Su Giudeu beach. The complex takes its name from the fascinating waterfall pool Oasis, surrounded by the Mediterranean gardens. The guests of Spazio Oasi and Hotel Laguna have the privilege of having direct access to the top of the pool. 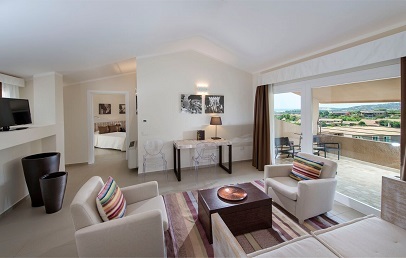 There are 34 elegant rooms at the Hotel Spazio Oasi. All are overlooking the sea or the Resort and have complimentary Wi-Fi connection. Garden (20-25 sq.m.) – Suitable for a romantic holiday, they’re located on the ground floor, just a few steps from the splendid pool. The large windows overlook the lush garden, where you can enjoy the cool of the evening in a comfortable private lounge. Family (38-43 sq.m.) – Located in the upper floors of the Spazio Oasi with two separate rooms, ideal for 3/4 people and a baby cot. Garden Deluxe (47-50 sq.m.) – Suitable for couples or families of 4 persons, they have a private garden with a comfortable sitting area. The rooms are on the ground floor overlooking the pool Oasi. Superior (44 sq.m.) – Located on the first floor, they're ideal for couples or families of 4 persons. They consist of a spacious living room separated from the sleeping area. Balcony Deluxe (38-44 sq.m.) – Located on the first floor, they reflect the characteristics of the Superior. 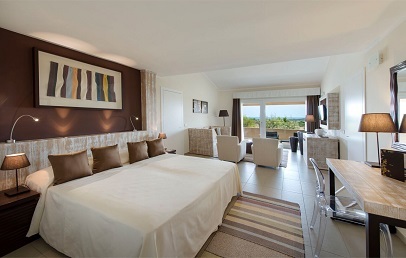 They differ in the presence of a comfortable balcony that offers panoramic views over the bay of Chia. Balcony Suite (70-80 sq.m.) – Designed to comfortably accommodate large families, are composed of two bedrooms with private bathrooms, spacious living area and terraces that offer stunning views of the Bay of Chia. Dine-Around Program without supplement, reservation required. The Chia Express mini shuttle train is available throughout the entire day to reach comfortably the nearby beach Campana. The fine white sand and picturesque dunes are about 700 meters from the complex. The beach service is included from the third row (first and second rows are subject to charge, except for some room types). The new wellness centre Chia Natural Spa offers a fully equipped fitness room, Turkish bath and emotional path. There are also several types of massages and beauty treatments. The guests of the Hotel Spazio Oasi have direct access. The Golf professionals can easily reach the nearby Golf Club Is Molas thanks to the shuttle service. Moreover there is the possibility to play tennis at the Tennis Club Chia (individual lessons available); to explore the seabed and practice several water sports at the Diving Center and at the Nautical Center of the Chia Laguna; to participate and to organize football matches; to take part in exciting excursions and suggestive riding to discover the beauty of the area of Chia. A range of services dedicated to families, several Clubs and the Baby sitting service, available 24 hours. Discover further information here. Parents can furthermore take advantage of the welcome baby kit and buggy (upon request and availability), it is a free service designed to facilitate parents traveling with their children. The restaurant dedicated to the guests of the Spazio Oasi is the Club House, with à la carte service. Moreover there is the opportunity to book the Dine Around Program (reservation required, for a fee) and have the possibility to choose every night a different restaurant in the Resort. Younger children can enjoy the Bimbi Restaurant, where they will learn the names of the dishes and will taste delicious food. Loungers and parasols are available by the pool Oasi as well as at the beach "Campana", reachable with the little train Chia Express shuttle service throughout the entire day. The rooms are on the ground floor and are decorated in shades of white and ecru. Elegant, bright and fresh, they are characterized by decorations in Sardinian style revisited in modern key. The bedroom looks out through large glass doors on the fragrant garden of Mediterranean vegetation, furnished with a comfortable outdoor lounge area. 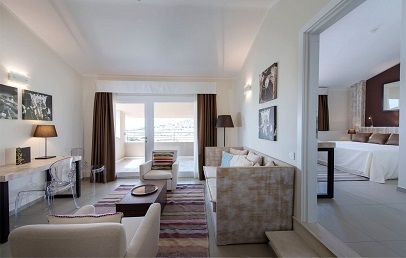 Located in the upper floors, the Family Rooms are composed by two rooms and are the best solution for families. They offer a wonderful panoramic view (through a window) over the Bay of Chia. 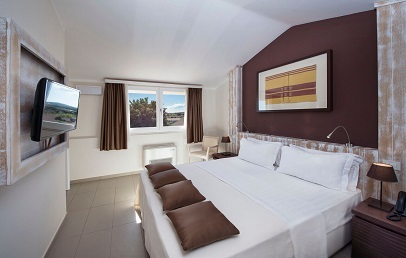 The Superior rooms are on the first floor and are decorated with big attention to detail. The style, which recalls the tradition with modern touches, is fresh and elegant. They are suitable for families of four or couples who love the convenience of spacious places. They have a living area separated from the sleeping area. The Balcony Deluxe rooms are on the first floor and are decorated in the shades of white and ecru, with big attention to detail. The style, which recalls the tradition with modern touches, is fresh and elegant. They are very spacious and suitable for families of four or couples who love the convenience of spacious places. They have a living area separated from the sleeping area and dispose of a nice balcony offering amazing views over the bay of Chia. The Garden Deluxe rooms are on the ground floor and are decorated with big attention to detail. The style, which recalls the tradition but with modern touches, is fresh and elegant. They are suitable for families of four or couples who love the convenience of spacious places. They have a living area separated from the sleeping area. They overlook the pool and offer a comfortable living area in the garden with outdoor seating. The rooms are on the first floor and on the second floor and are decorated with big attention to detail. The style, which recalls the tradition with modern touches, is fresh and elegant. Very refined, the Balcony Suite rooms are composed by two bedrooms with private bathroom, spacious separated living room and wonderful panoramic view from the terrace. They’re the best solution for large families. Dine-Around Program without supplement, reservation required. 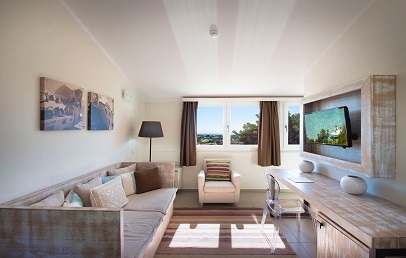 Special Early Booking: 25% reduction for bookings confirmed within April 30th 2019! Long Stay - Book at least 7 nights by April 30th 2019 and the last one is free of charge (stays until June 14th)! Long Stay - Book at least 10 nights by April 30th 2019 and the last one is free of charge (stays from July 20th to August 16th)! Long Stay - Book at least 10 nights by April 30th 2019 and the last one is free of charge (stays from August 24th to September 6th)! Long Stay - Book at least 7 nights by April 30th 2019 and the last one is free of charge (stays until July 19th)! Long Stay - Book at least 7 nights by April 30th 2019 and the last one is free of charge (stays from September 7th to October 12th)! Long Stay - Book at least 10 nights by April 30th 2019 and the last one is free of charge (stays from July 20th to August 9th)! Sport Week: from April 18th to 28th Full Board included in the price (beverages not included, minimum stay 2 nights)! For customers staying in an Oasi Balcony Suite: beach service in the first row included. 1 daily Bioaquam circuit at the Chia Natural Spa per each full paying adult!